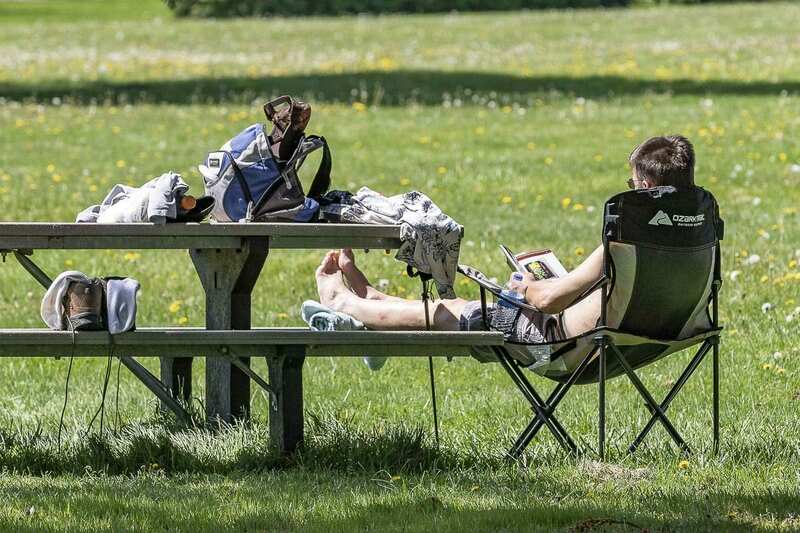 VANCOUVER — Public Health officials are urging residents to take precautions to prevent heat-related illnesses during the stretch of hot weather this week. The length of the hot spell, coupled with warm overnight temperatures that provide little relief from the heat, can create a risk to health and safety. Clark County Public Health officials are urging residents to take precautions to prevent heat-related illnesses during the stretch of hot weather this week. Drink more water and other nonalcoholic fluids, regardless of your activity level. Limit intake of drinks with caffeine, alcohol or lots of sugar. Stay indoors, in an air-conditioned location, as much as possible. Never leave a person, especially a young child, or a pet in a parked vehicle. Temperatures can rise rapidly in parked vehicles, even with the windows rolled down. Fans will not prevent heat-related illness. Cool off in the shower or bath or go to an air-conditioned place. Wear lightweight, light-colored, loose-fitting clothes. Limit outdoor activity to morning and evening hours when temperatures are cooler and drink two to four glasses of nonalcoholic fluids each hour. Check on co-workers while working outdoors. Rest often in shady areas. Wear a brimmed hat and sunglasses; apply sunscreen of SPF 30 or higher. Battle Ground Community Center, 912 E. Main St., 8 a.m. to 3 p.m. daily. Firstenburg Community Center, 700 N.E. 136th Ave.; 5:30 a.m. to 9 p.m. Monday to Thursday; 5:30 a.m. to 8 p.m. Friday; 8 a.m. to 7 p.m. Saturday; noon to 6 p.m. Sunday. More information: (360) 487-7001. Lobby of Firstenburg Tower at PeaceHealth Southwest Medical Center, 400 N.E. Mother Joseph Place, 7 a.m. to 7 p.m. daily. City of Washougal Municipal Complex, 1701 C St.
City Hall, 8 a.m. to 5 p.m. Monday to Friday. Washougal Library, 10 a.m. to 6 p.m. Wednesday, Thursday and Friday. Washougal Community Center, 9 a.m. to 3 p.m. Monday to Thursday; 4-6 p.m. Friday. Additional information on cooling centers is available at http://cresa911.org/2018/07/23/updated-hot-weather-information-and-cooling-centers. Knowing the signs of heat illness is important. Heat stroke can cause death or permanent disability if emergency treatment is not provided. Warning signs of heat stroke include body temperature above 103 degrees; red, hot and dry skin (no sweating); rapid pulse; throbbing headache; nausea; dizziness; and confusion. If you see any of these signs, call 9-1-1. Place the victim in a bath or cool shower or spray the person with cool water from a garden hose. Do not give the person fluids to drink. Less severe heat-related illnesses include heat exhaustion and muscle cramps. Signs are heavy sweating, paleness, weakness, headache and vomiting. Drink nonalcoholic, cool beverages. Seek medical attention if symptoms worsen or last more than an hour.